Colours Of Our Lives | Experiences and Adventures The Sin Ming Court Gang Of Three Have di Jakarta. Experiences and Adventures The Sin Ming Court Gang Of Three Have di Jakarta. I was first introduced to the Khan Academy when I went for a talk on audience engagement in the arts a few months ago. Googled it up and found out that the founder of the said academy, an American online learning platform, is the brain-child of another Salman Khan, MIT graduate and wiz educator. His videos explaining mathematical concepts are so clear and simple that they got Mister M hooked. For once I didn’t mind so much that Mister M was stuck to the computer screen. We also discovered that Khan had more than Math videos. There are educational clips on Science, English, History and a whole host of pre-tertiary and tertiary subjects as well. Signed up for an account quickly for Mister M to fiddle around with. After awhile both Mister M and I thought: Khan Academy pretty much made redundant conventional schools. Haha if only 😏 There is, of course, definitely value in the interaction a physical school offers although in certain cases, the potential for teacher-student and student-student interactions are barely reached due to various circumstances and reasons. I can of course go on and on about this but this is hardly the point of this post. 1) Sal Khan’s mission is mind-blowingly simple: Free world-class education for all. It conjures up an educational utopia where knowledge is everyone’s right and acquired for knowledge’s sake. The other end of the spectrum is where education is monetized for the purpose of out-doing one another. Those who are familiar with the Singaporean tuition scene, think a certain Lab housed at United Square and the other smaller outfits that have mushroomed all over the island. Imagine: Free world-class education for all. Oh how merely thinking about it brings a smile to my face. I will attempt to talk a bit more about the article in the next post. In the mean time, do read it especially if you find yourself struggling with it. Either the first day of school was not as earth-shatteringly exciting as mummy had hoped or this big boy was too cool to be all bubbly and chatty about all that went on but he said very little when mummy tried to make conversation. M: So what did you do in class? BB: We went to the library. M: Oh ok. (pause) So did you enjoy yourself? 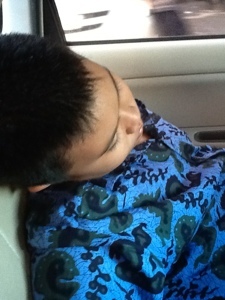 And so mummy figured she’d let the big boy volunteer whatever information he wants to share whenever he wants to share it because like her son who totally knocked out on the ride back home on the macet-ed* roads, she was really tired too. Thank goodness she was not the one behind the wheels! *macet: Unparalleled, Indonesian-style traffic jam that defines Jakarta. The Gang of Three is back in Jakarta after 10 days in SG. #3 has finally started school after an extended 3 month break. WEEPEE! 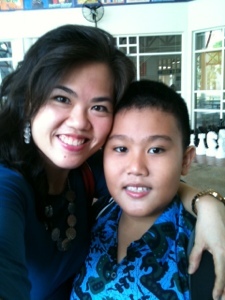 Goes both mother and son before setting off for BIS in Bintaro, about 35 minutes away from APG via the toll road when the traffic is kind. Mateen and the class notice board. Checking out Star Wars at the library. Today, #2 is feeling a little out of place, disoriented and bored at the Buskers Cafe while waiting for school to end at 2.40 pm. One more hour to go! Ok it hasn’t been all that bad actually. While #3 is getting rid of his cerebral cobwebs in class, #2 had free refreshments at an event she chanced upon to welcome new parents (except everyone there seemed to be an old hand in school), signed up for the Indonesian Heritage Society welcome meeting, found out about the English language museum tours at the National Museum (have been thinking about going for a while), submitted the form for the driver’s pass, ordered name labels, signed #3 up for a swimming assessment and met new people. Takes a bit of effort but it beats drinking aqua alone………………………………………………………. 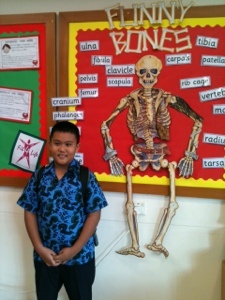 Will sign off for now, trot to the year 5 block and return with tales of the first day of school shortly. 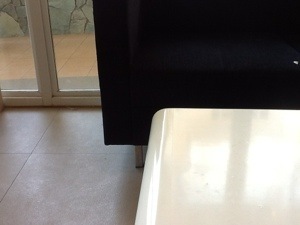 #2 & 3 of the gang are back at Apartment Permata Gandaria again! 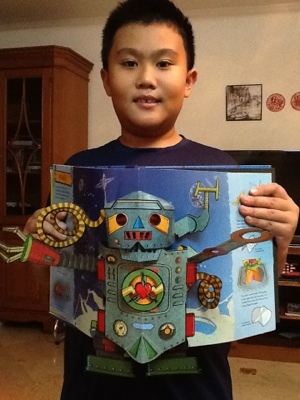 Just before heading back to Jakarta, #3’s dear uncle Jo gave him a super cool Pop-up book. Check out this cool robot! 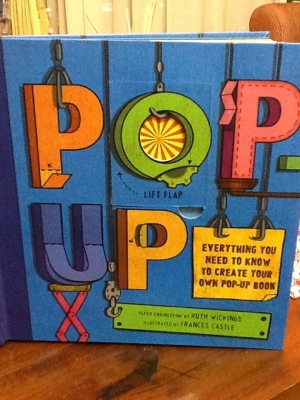 There are also very clear templates and step-by-step instructions on how to build a pop-up dragon, castle and Frankenstein’s lab! 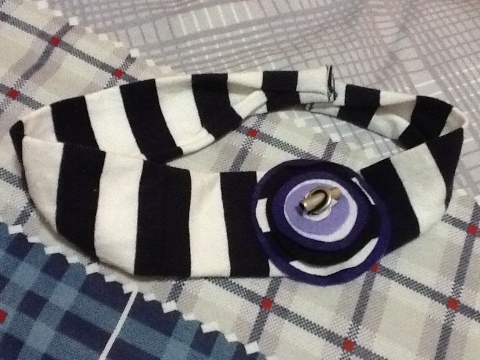 Will upload photos of the finished work after #3 conquers his fear of producing something imperfect and start creating. Fear or no fear, #3 chanced upon Pop-Up demo videos on YouTube. Here’s one he found that his mother really likes! Actually, it’s only two-thirds of the Gang in SG now. #2 was starting to get restless with a lot of time on hand. Then she got handed parts of her mother-in-law’s to be spruced up. Woopie! 😀 Darn proud of her handiwork is she! (and very humble too might I add! ;p) Read all about it here. #2: So did you have fun just now? Feeling good? #3: Yah very fun! There were many people playing. #3: I just asked the boys whether I can play and they say can. But they said ‘no’ to two girls. Because they are Chinese lah. #2: So what did you say to them? Did you ask them to let the girls play too? #3: Yah I did but they say dunwan lah. Because they are Chinese. #2: But how did they know you are Malay? #3: I spoke in Malay mah. 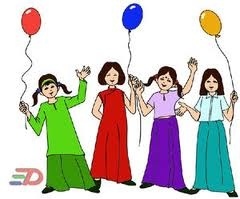 #2: You should tell them you’re half-Malay and half-Chinese and it’s okay for everyone to play together! #3: and then they said but Racial Harmony Day over already! Like this archaic drawing, racial harmony is probably still an imagined ideal for many. Living, playing and learning together harmoniously regardless of race, religion and gender, according to the candid boys, takes place only on that one precious day. The Gang of Three is now back in SG. It all began with an early morning call from #1 of the gang. He had been admitted to Bangkok’s Samitivej Sukhumvit Hospital. Within 24 hrs flights to Singapore and Bangkok were booked, #3 of the gang was dropped off at his grand aunt’s before his mother, #2, got on a plane to Bangkok. By the next day the three were together again, breaking fast on the first day of Ramadhan with the extended Woodlands family. It was an amazing, surreal and impossible 48 hrs if not for Viber, What’s App, Skype, Google search, budget airlines and Godsend super taxi driver bapak Muji Pranoto who appeared after a nerve-wrecking 15-minute wait. We had just been told that with 90 minutes left there’s no way we can reach the airport in time while navigating the infamous Jakarta macet (the grand ancestor of traffic jams). I am close to tears by now and would have really broken down if not for the sight of the white Express taxi pulling up the driveway. Alhamdullilah! I breathed and Mateen exclaimed. With relief, hope and apprehension we loaded the bags into the boot and began our journey to the Soekarno Hatta International Airport. The beginning of the taxi ride was smooth enough with the bapak knowing the road conditions and his jalan tikus (the alley of rats) well. In no time we found ourselves on the main thoroughfare of Jalan Sudirman and heading towards the airport. Still we were cautious to breathe easy because the notorious jam really begins on the jalan toll (expressway). The incredible stories of commuters stuck for some 5 hours and missed their flights were starting to look like reality for us. 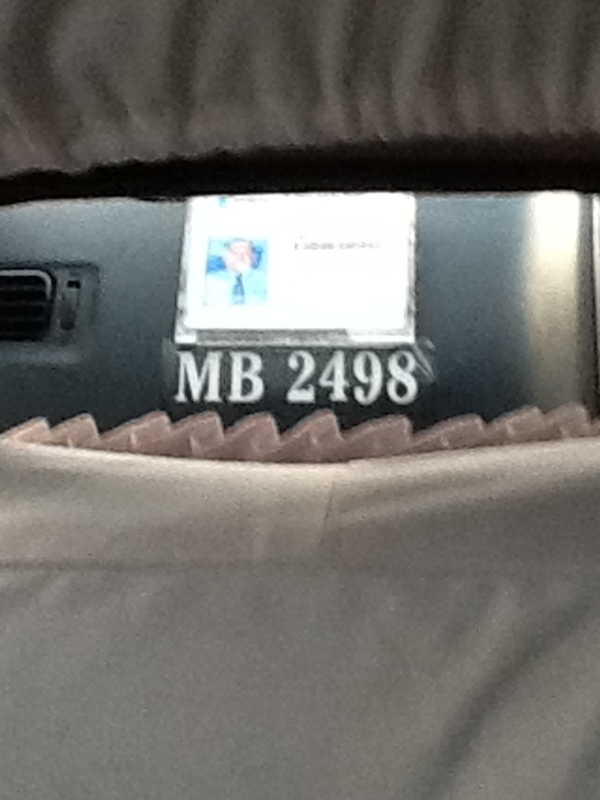 At the toll booths, the taxi started to c-r-a-w-l. Traffic was crazily slow and my heart was beating fanatically fast. Eventually we managed to pay the toll and got onto the expressway stacked with all kinds of vehicles: luxurious ones, battered and soot-emitting ones, heavy ones, agile ones. I think I have never prayed so hard before. Please please let the roads open so that we can get to the airport on time! It took a little while but slowly, miraculously, one pocket of space opened up after another and pak Muji got us weaving in and out of the mad traffic. Soon my prayers for a clear road became prayers for a safe journey. After 40 minutes of intense concentration, we finally left the other vehicles behind and were flying towards the airport. That was when we saw the majestic kites soaring in the blurry blue skies. Alhamdullilah and thank you bapak Muji Pranoto! One quick shot before the Blue Bird arrives. Mateen with Cik Ahmad and Abang Nadir. Where’s Abang Dzafir? Couzie Yati with Najya before boarding the plane. 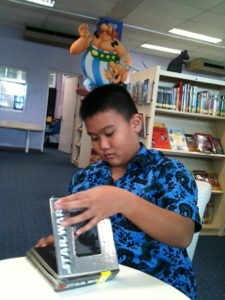 Mister Naufal of the Woodlands Gang. Well, with the blog we will endeavour to do better! P.S. This is actually the second piece I wrote for the blog. Wanted to experiment with the “Pages” feature but think it’s more accessible here. Packing up to come to Jakarta made me realised how much consumables i.e. shoes, clothes, bags and accessories I have amassed and junk I have hoarded. Horror! So I told myself firmly “NO SHOPPING!” and brought whatever scraps, fabric, odds and ends I can despite being told that I’m bringing one too many useless things. and anything I think I might be able to use to make something out of some day. EVERYDAY WILL be THE day here in Jakarta! Pot holders I made from scraps of fabric, an old shirt and packing foam. I only made the floral and orangey-red ones initially. 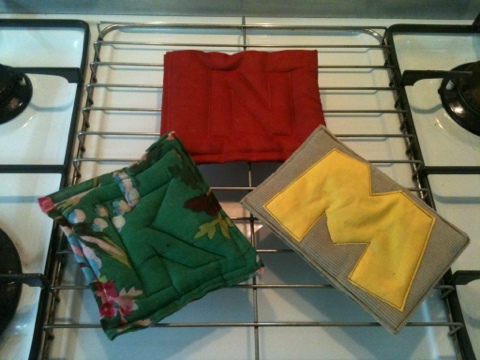 Made the third one with the letter “M” at Mateen Boi’s request cos he wanted his own pot holder. And if you’re wondering if he has put it to good use, YES HE HAS! 🙂 He made fried rice and scrambled eggs for me but that’s another story. 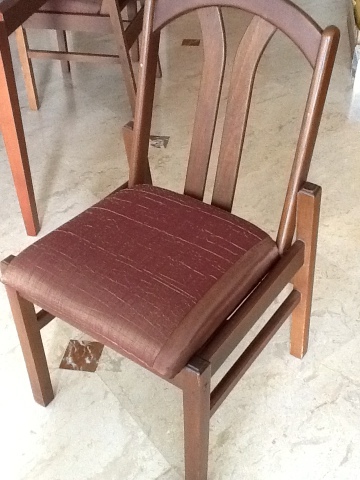 One of the first things I did was to reupholster the dining chairs. 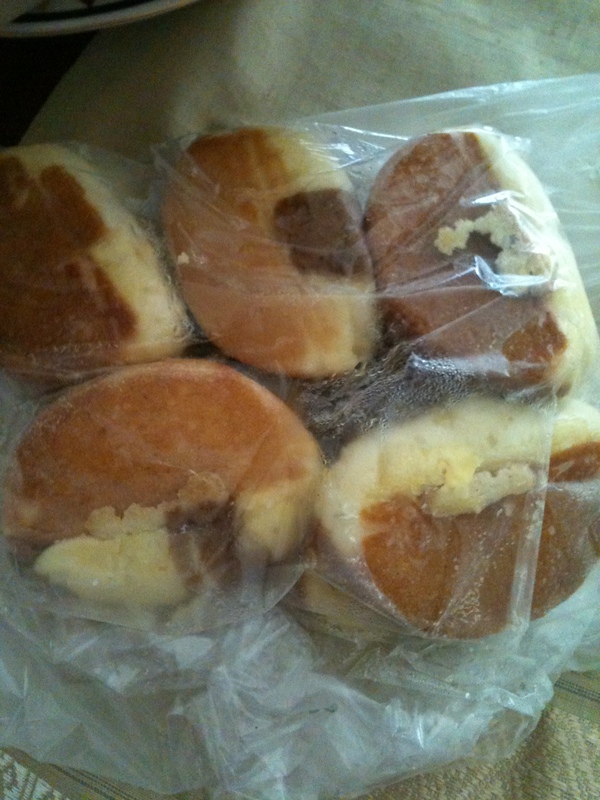 The original ones were beige in colour and looked really yucky with food spills and all. The chair covering should be the last thing to ruin our appetites right? The guest toilet needed a mat and dash of colour. So I decided to repurpose (that’s a new word I learnt from the pros who have been doing this way long than I have) a floral shirt and towel with stains that refused to budge into this. The end product has a red “T” at the bottom right. 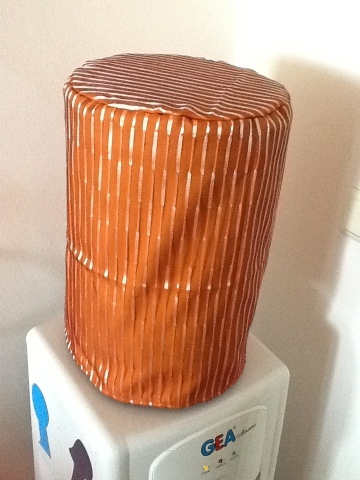 Got the idea to make this cover for the water dispenser after seeing it in a local’s home. 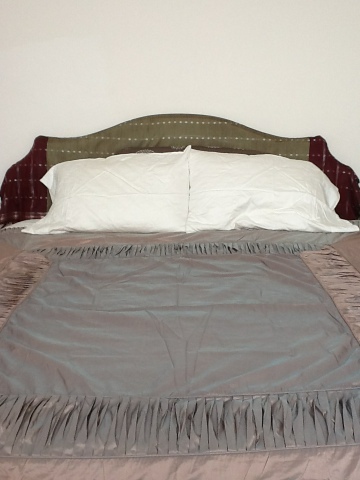 Repurposed a shawl into a headboard cover. The original baby blue floral pattern just doesn’t go with the overall scheme of work! 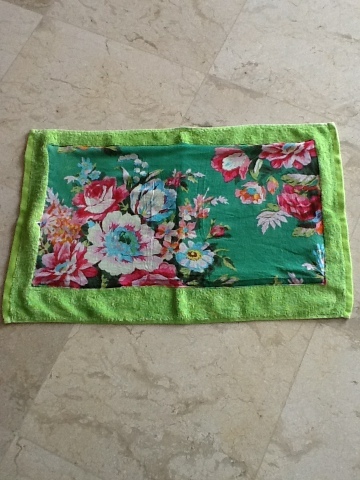 Had identical cloth for wiping dry dishes and hands. So I found an obvious way to differentiate them! 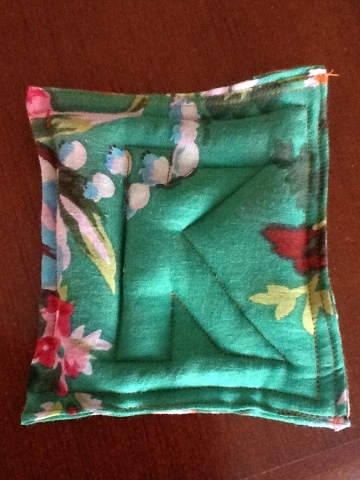 Hairband made from repurposed t-shirt sleeves and felt pieces for a sweet young lady who just finished reciting the Qur’an. 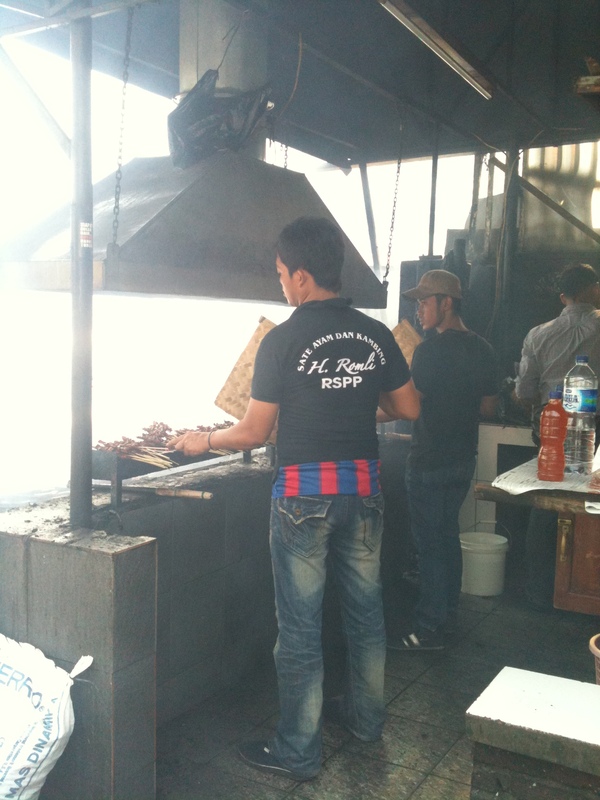 Jakarta is food paradise for us! Many eateries which are not halal back home are halal here! On top of that, you get solid good cuisine of various cultures at reasonable prices (relative to the quality and sometimes exorbitant prices we used to pay!) The variety of offerings at Gandaria City, a mega mall a short walk from our apartment, is enough to spoil us rotten. Nevertheless we got bored with the air-conditioned comfort of restaurants and cafes (ingrates we are not, promise!) and just needed a bit more excitement. So on Saturday, we took to the streets and walked to Mayestik where the locals do their pasar shopping and stock up on sewing supplies. The latter of course got me super excited! I am already looking forward to my next trip there. Ok back to our food adventure. Well sort of. After a not so impressive bubur breakfast at Mandalay Restaurant established in 1962, we bought some yummy-looking kueh from a cart. Super rich tasting cheesy chocolaty kueh which cannot be named here. The kueh cost a mere IDR10,000 for 10 generous pieces! That’s SGD$1.30! 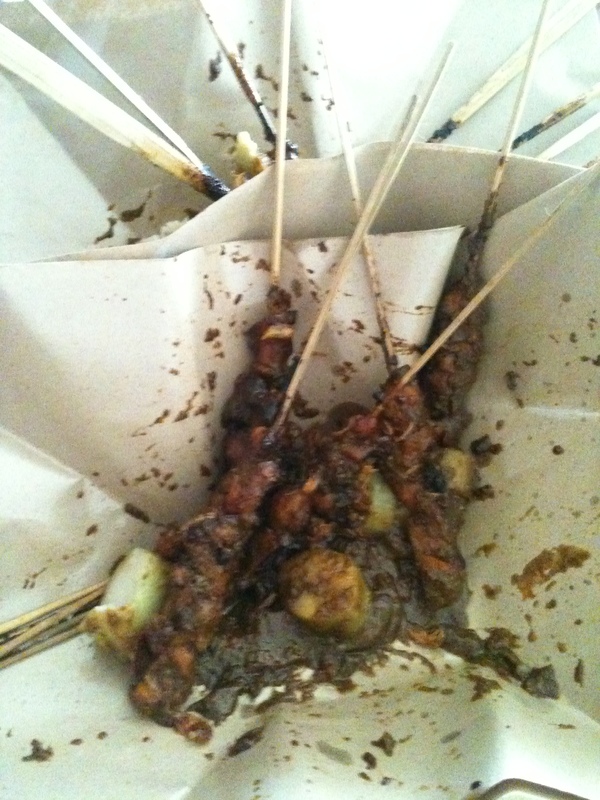 After that we walked to a really popular satay stall near Rumah Sakit (Hospital) Pertamina. People usually order by the hundreds and queues get really long later in the day. 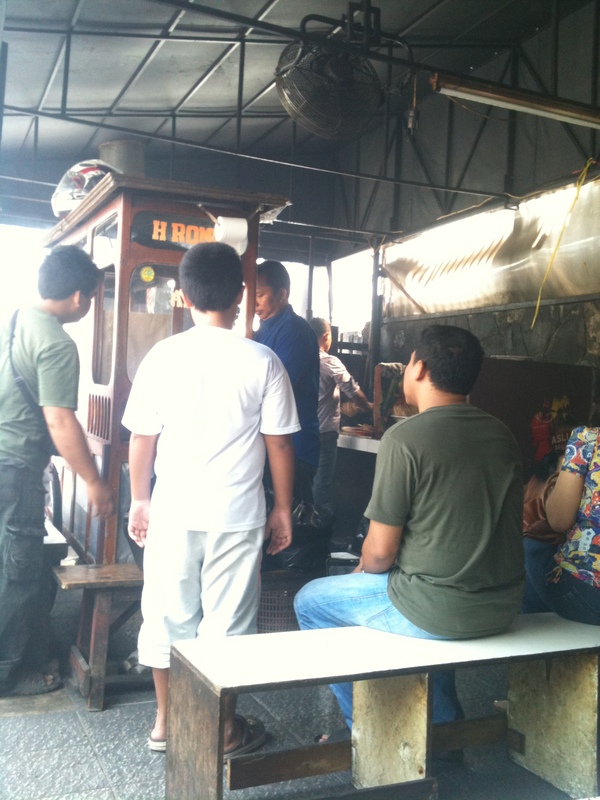 After ordering 10 pieces of ayam (chicken) and kambing (mutton) satay to go, we waited by the stall for our order. Then Kamal muttered something about the stall being just next to the road with its smoke-belching traffic. But that just adds to the flavour of charred carcinogenic treat! Okay time to stop the chatter and let the pictures do the talking. Waiting patiently for the gravy drenched satay. The satay man hard at work. Couldn’t capture the bellowing smoke. 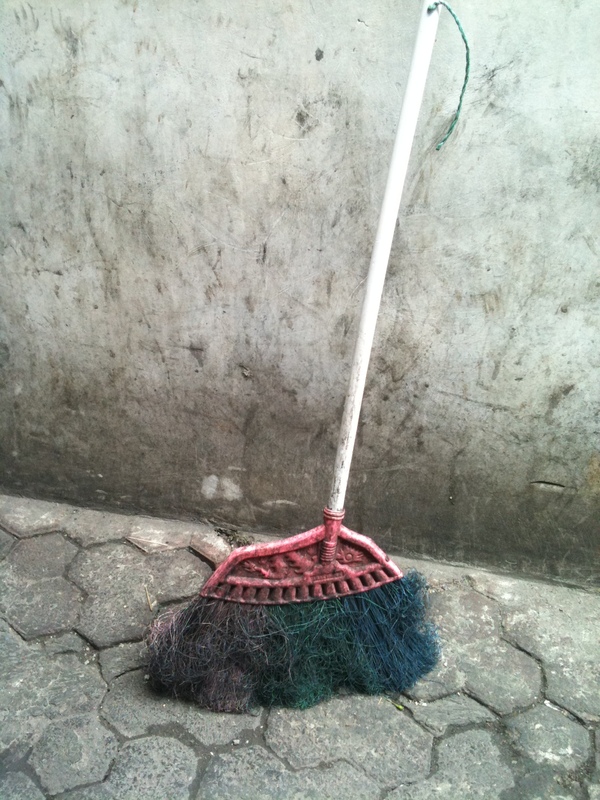 I guess the broom is an indication of a decent standard of hygiene? A big HULLO from us three! So I’ve decided that Colours Of Our Lives will be about things the three of us see, do, hear, feel, touch and taste by ourselves, with friends and/or family. 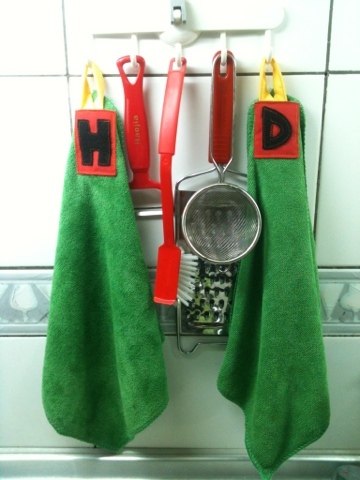 Colours Of The Domestic Goddess, on the other hand, will be about my artistic explorations and creations.